This post was supposed to be a recipe for some lovely little spiced carrot cupcakes. You see, it was my birthday last week and I wanted to make you (me) something special. They were going to light and fluffy, totally healthy, slightly sweet and topped off with a orange and maple coconut cream frosting. Something that says, I’m 28 now, and I want a sophisticated cupcake. Except they weren’t. They weren’t any that. They were wet and gooey and gummy, better used as door stops and paper weights than any treat for a celebration. Three times over. Three different trials, three different recipe tweaks, but none worthy of the dream-like cupcakes I was hoping to share with you all. So, there are about 3 dozen sticky carrot cakes in my freezer if anyone’s interested. We are slowly making our way through them, and as I absolutely hate throwing food away, I have been trying to salvage them by slicing them in half, toasting them and spreading with almond butter – turns out, not so bad. not too bad at all. 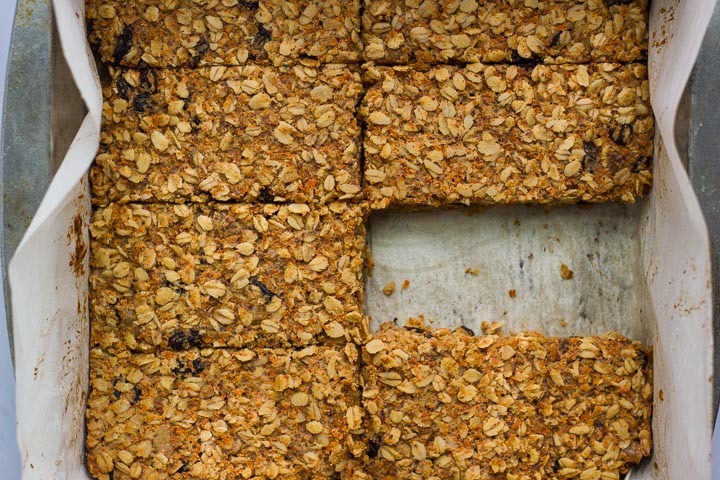 And thus, a new recipe was born – morning glory breakfast bars. I took all the flavors and ingredients I used for the muffins, altered it slightly and set out to make a soft yet crunchy morning glory breakfast bar. A delicious and nutritious snack any time of day. Fully loaded to keep you going and sneaking a little veg into your morning meal always makes you feel like a nutrition super hero. Vegan and gluten free. Makes 8-10 bars. Toast oats, nuts and seeds in a dry skillet over medium heat until slightly brown and fragrant. Transfer to a large bowl and stir in cinnamon, salt and raisins. Combine all the wet ingredients in the food processor. Shred the carrots first, about 2 small carrots should yield one cup, change out the blade but the keep the carrots in the blender and add in applesauce, almond butter, almond milk, coconut oil and ground flax. Blend until well combined. Add the wet ingredients to the dry ingredients and mix well. Press the mixture into a 8 x 11 baking dish, lined with parchment slightly overhanging the sides. Using a flat bottom surface, (measuring cup, metal spatula, etc.) smooth out the top and press down evenly so that the bars and nice and compact. Drizzle over with the extra melted coconut oil and spread across the top of the bars, this will make them nice on brown. Bake in the oven for 40 minutes or until top and sides are golden. Let cool completely, then using the sides of the parchment paper remove from the pan (I let mine cool off overnight) Slice into bars, I got 10 bars out of my batch, but depending on the size you want you could get 8-12 I’d say. Keep the bars in a sealed container for about a week, or store in the freezer. Wow these look great! 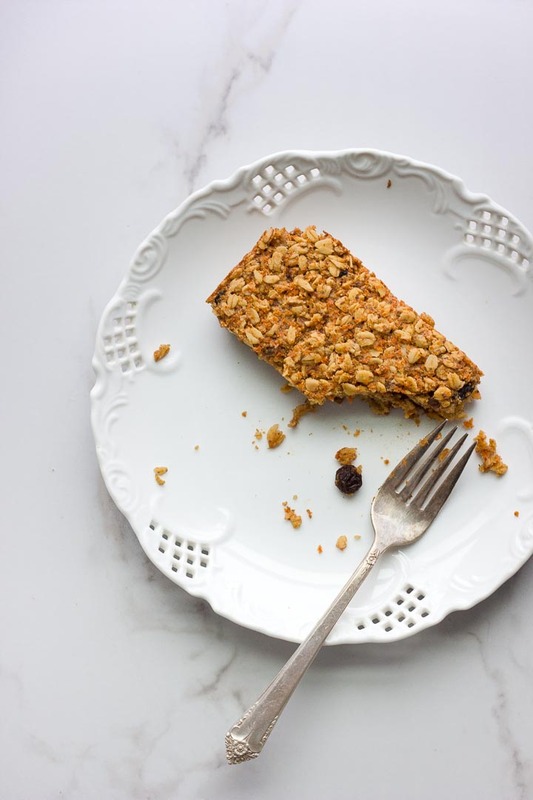 I need to make some granola bars soon for snacks during school since I don’t have much time to make anything on the spot! thanks for sharing! Yummy……like this delicious apricot loaf cake recipes because it’s healthy and tasty.